I don't know about you, but I am still far more convinced of the 'virus induced zombiism' than any 'rising from the dead' type of thing that might happen and therefore, more fearful of it. As someone who is often fully immersed into the world of pop culture through the tv shows I obsess over, it's easy to believe that the things being portrayed can come true. I fully believe that the human race might live in a space station for 100 years because there was a nuclear war that made Earth completely unlivable or even span out across universe because our technology has advanced so far and that Vampires exist but have found a way to live among us to avoid drama and that there are people out there who spend their lives fighting monsters and demons and saving the world so that we all might live to see another day. So why would it be such a stretch to believe that something, which we already have so many of, could either mutate or combine with another virus (which has happened before) and create a virus that causes us to act, well, like zombies? It is unlikely that the virus would be spread solely by bites but (SPOILERS) it could be very much like in the Walking Dead where everyone is already infected, so could be airbound or like other diseases and infections that are spread through 'bodily fluids' (urgh, I hate saying those words). Not so far fetched when you really think about it. 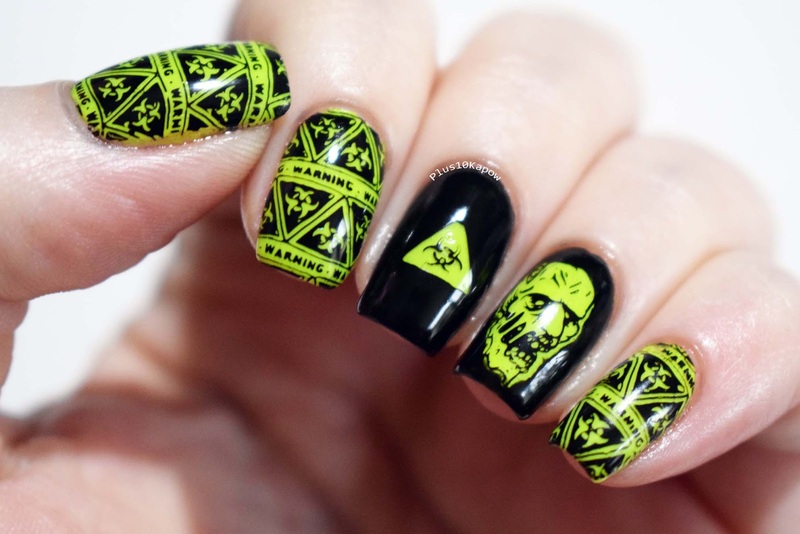 So that is kind of what I was going for today with the Zombie Biohazard nails. That's all my thinking done for today, phew. 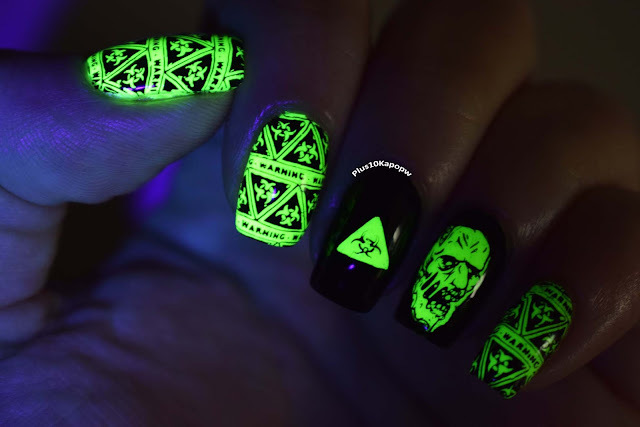 Bonus: they are UV reactive! 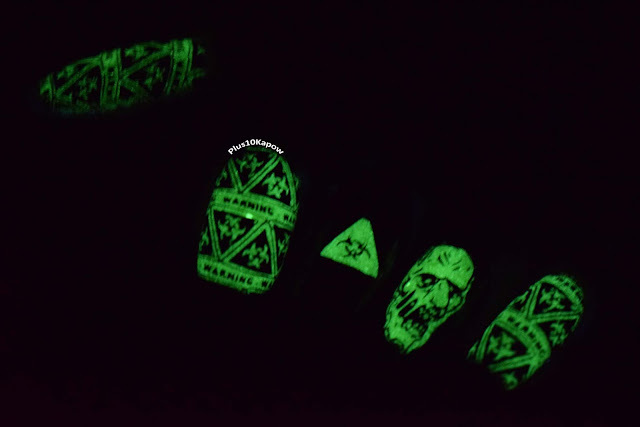 Even bigger bonus: they are glow in the dark. Kind of like toxic waste. Do you think that Zombie parts would be classed as toxic waste or medical waste if it were indeed a virus? For the photos, I charged Wikkid Polish Yellow Glow with a UV torch to get it to show so bright on camera. What have you got on your nails for Halloween, something scary I hope! Happy Halloween, have a spooktacular night!